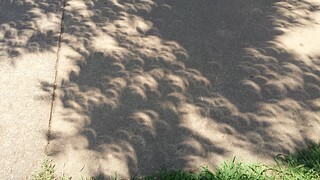 I had known the eclipse would start shortly after one o'clock that afternoon. I wasn't quite sure if the sunlight was dimming, and the occasional clouds were throwing off my perception. While stopped in traffic I checked a pinhole image through a postcard and could barely see that the moon had taken a bite out of the sun. 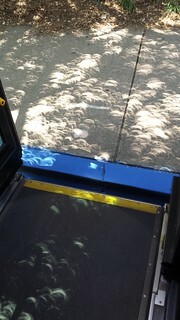 I did not notice these crescents everywhere until the eclipse had progressed. It also took some time to really notice that the sun was less intense, though the world still looked pretty much the same. 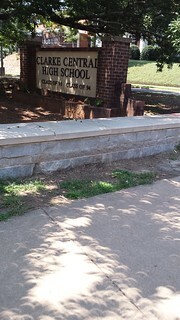 When I drove around to Clarke Central High School, I had been mesmerized by the crescents for quite some time. Traffic had been pretty light, which I guess was not surprising. People were either out of town to visit the total eclipse zone or else staying in place for their eclipse viewing parties. 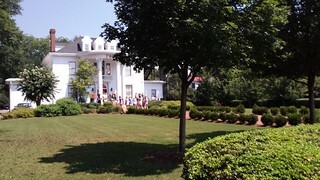 There were small groups of people up and down Milledge Avenue with eclipse glasses, standing outside offices and Greek houses. One office building had a tent which reminded me of football tailgating, but none of the crowds were that big. Even my glimpses of the stadium revealed no one in the upper decks. 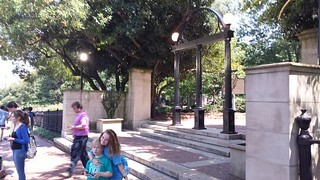 By the time I reached the Georgia Center for Continuing Education, the crescents were thinner, and the dimming of the sunlight felt really, really weird. Of course, there were idiots driving around in a near-total eclipse without headlights, just like they drive in the rain and sunset hours without headlights (not surprised). When I first noticed that the sunlight was getting dimmer, it felt like there was a haze in the air. But then I would blink and see how clear and sharp everything was, just like it was a clear, sunny day. The best way to describe the darkness was like looking through sunglasses. But since I wasn't wearing sunglasses, it felt like I was looking through a darkly tinted window -- except, wow, those traffic lights were just as bright as if I were seeing them at night. My first real bit of luck was finding that I reached the Henderson Avenue bus stop at or just before 2:38 p.m., the peak of the eclipse for Athens. This bus stop has a bus bay which allows us to get out of traffic, and we often use this location to park and kill time to adjust the intervals between the buses in front or behind us. 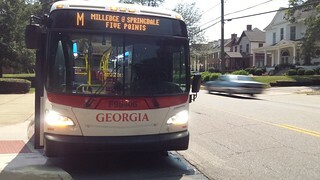 I took this next photo of my bus at 2:38 p.m. It does not look that remarkable, but the light was really comparable to twilight just after sunset. You can see the aisle lights inside the bus as well as notice how bright the headlights are, and my smartphone camera selected a shutter speed of one-fifteenth of a second with an aperture of 2.2 and an ISO setting of 200 (for a scene darker than many indoor photos). I also took a photo of the nearby Gamma Phi Beta house, though other than looking at the camera settings, the blurred photo does not look that remarkable. When I arrived back at the Arch where another driver relieved me for my lunch break, I saw that it had indeed been dark enough for some outdoor lights to turn on. A security light at 191 East Broad Street was turned on, and the lights at the Arch were still on. The sun was getting brighter, and the party was over. Two ladies wearing T-shirts with eclipse artwork offered me a brochure for Pamela's Sensational Cleaning Service. I texted my son's mother to check in and see what they thought of the excitement. I found out later that my son was much more interested in a TV show than the fact that it was getting dark in the middle of the day, but his mommy was keeping him inside for the safety of his vision anyway. He will be ten when we have the next American eclipse, so maybe he would like to make travel plans to see totality. I took the afternoon off and we sat on the deck to observe the eclipse. I was prepared to hear the crickets and tree frogs sound off as it got darker and darker. What I wasn't prepared for was the reaction of my little dog. She will frequently, during storms, come over and sit on my foot or press up against my leg. She needs that physical contact for comfort. Thats exactly what she did when it got dark. She came over to my chair and sat up against my foot/lower leg. Once it started getting bright again she returned to normal. It was strange to see the darkness descend and it even seemed to be quieter except for the crickets and tree frogs. It was a beautiful thing to experience.